Check out these new duds. I’d say it’s a step up (revolution) from last year’s list which, if you couldn’t tell, was drafted as I was just learning how to edit photos. I was but an untested noob still gesticulating in the sewer, as it were. This year I had the benefit of Jeremy G. Butler designing these splendid works throughout the page. And a huge thanks to the man. If you see a visually appealing graphic on the site, Jeremy’s the culprit 90% of the time. Anyways, movies. 2012. Good year. I know, how does a film made in 1987 make a Best Of list in 2012? Connection debuted in but a scant eight theatres in 1988 and died quietly, never achieving national distribution until Drafthouse scooped up a print in ’09 on an eBay blind bid (for the above mentioned price), restored it and gave the film a proper rollout. Its beauty is surely in the eye of the beholder, but can any film featuring a new wave synth pop band of taekwondo practitioners facing down a conglomerate of cocaine-dealing, motor-cycle riding ninjas be truly awful? As it turns out: yes. But Miami Connection provided me the most communally satisfying theatrical experience in all of 2012. Hilariously misguided, painfully acted, horrendously blocked, Miami Connection is a crowd-pleaser for the right kind of crowd seeking the right kind of pleasure. And, for the immense joy it’s brought me, more than deserves a spot on this list. Performance to savor: Future (at the time, now former) UFC World Heavyweight Champion Maurice Smith’s grand legacy may now be his performance as Jim, the scrawny, whiney member of Dragon Sound who just really wants to find the father who abandoned him. There’s something so sweet in Jim’s otherwise vacant eyes. He’s a smile waiting by a mail box, waiting for a letter that’s yet to arrive. When it finally does? Cinemagasm. Buy it from us. Josh’s Blu-ray Review. Put anybody else in the director’s chair and Playbook’s chances at success are likely to take a dive. But David O. Russell’s brilliance lies in his ability to find heart in those quiet, in-between moments. A good thing, given most of the film is a gigantic between-moment – one that finds its leads shedding their past transgressions for an uncertain future. Distracted at times and perhaps a touch too cheeky for its own good, Playbook still triumphs as a meditation on mental illness and its ability to derail even the best intentions. Bradley Cooper gives the best performance of his career while De Niro proves he can still bring the goods if the material engages. 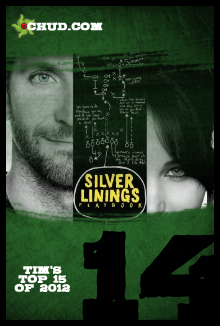 Not quite a romantic comedy, not quite a redemptive drama, Silver Linings Playbook instead dances within the in-between. Performance to savor: Who knew Chris Tucker was even capable of a performance? As Danny, the lunatic with a heart of gold, Tucker becomes his director’s ace in the hole. Any time the film threatens to lag, Russell brings in Tucker to pick it back up. And just like that, he’s gone again. A great turn that’s used sparingly by a wise filmmaker. Pre-order from us. Renn’s Review. What strange parallel universe is this? A film starring the fat kid from Superbad, the John Cena-looking dancer from Step Up, and directed by the Cloudy With a Chance of Meatballs guys? And it’s a take-off of 21 Jump Street, the TV show? And it’s good? Not only is 21 Jump Street good, it’s one of the funniest films of the year: an across the board success for all involved. Directors Phil Lord and Chris Miller once again show a knack for turning “can’t win” adaptations into “can’t miss” success stories. Here they use the “Dragnet Template” putting a comedy film smack dab in the middle of a cop procedural TV show. And it works. Meanwhile, Channing Tatum finds another opportunity to showcase hidden depths, this time comedic. Performance to savor: Tatum – who brings the right amount of affable charm and nuance to tough guy rookie, Greg Jenko. Jonah Hill’s the lead, but Tatum does the grunt work and carries the film on his back. 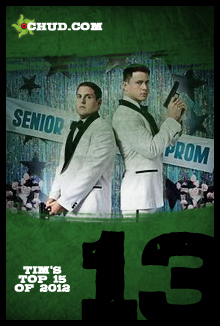 A great comedic pairing that produced one of 2012’s most-rewarding surprises in Tatum. Buy it from us. My Review. 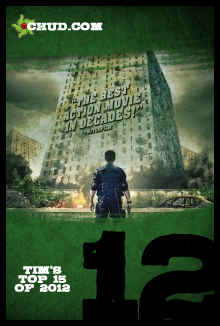 The Raid isn’t the future of action, it simply is action: unfiltered, balls-to-the-wall, knee-to-the-face, knife-to-the-scrot action. Brutality at its most elegant thanks to incredible choreography based around the unforgiving martial art of Silat. Director Gareth Evans and star Iko Uwais have perhaps made the most true-to-form videogame film of all-time: with a narrative that begins at level one and escalates immediately, until a final act that’s boss battles galore. Action in its purest, leanest form. Performance to Savor: Yayan Ruhian as Mad Dog, head foot solider of big boss Tama’s drug operation. Remember The Simpsons Yakuza vs. Mafia fight where Marge forces Homer inside before he gets to see the tiny, devilish-looking guy throw down? That moment right before you know that evil-looking dude’s going to do something insanely badass? That’s Yayan Ruhian for The Raid’s entirety. And you see it all. Buy it from us. Josh’s review. 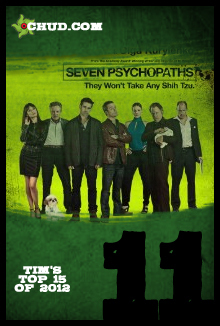 With Seven Psychopaths writer / director Martin McDonagh has unleashed a true “writer’s film,” guiding us through the mind of a troubled screenwriter as he goes about fleshing his exceedingly violent work. McDonagh’s not rewarding viewers looking for an easy point A to point B narrative, instead forcing us to go on a strange acid trip as he bends and morphs the film to fit his whims. It’s less of a coherent film than a window into the mind of a writer arriving at his story. And we never see that story in its entirety, just McDonagh’s arrival to it. Repeat views offer a variety of interpretations, as the film makes a phenomenal double feature with Jonze’s Adaptation. Performance to Savor: Sam Rockwell as Billy, best friend to Colin Farrell’s Marty. Rockwell commands every single scene he’s in with an unhinged comedic presence that might just define his career. 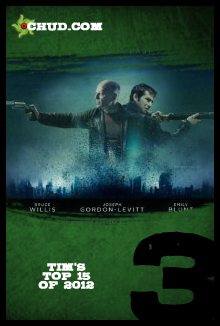 Billy is Travis Bickle by way of Lloyd Christmas, and Rockwell pushes himself into the next-level performance we’ve always known he was capable of. Buy it from us. Josh and I’s tag-team. One man’s misguided struggle to not be defined by the lifestyle that ultimately comes to define him. If 21 Jump Street proved Channing Tatum could be a star, Magic Mike cemented the notion – proving once and for all that dude can act under the right handlers. Here, the actor’s handled again by Soderbergh, reteaming after garnering another fine performance from Tatum in Haywire. This was a personal story for Tatum, one based in part on his own male-stripper exploits, and the film manages to dissect its chosen subculture to fascinating effect. It’s a modern-day Saturday Night Fever in its ability to take you in and hold you in the palm of its hand, allowing you to experience firsthand a world you may not be accustomed to. 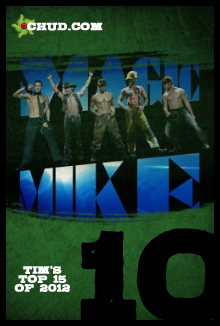 Calling this the “male stripper” movie is as egregious a faux pas as calling Brokeback Mountain the “gay cowboy” movie. Both works rise above any attempts to lazily categorize. Performance to Savor: There are a few, but I have to give the nod to Matthew McConaughey’s Dallas, boss man and stripper extraordinaire. Dallas is the guy Mike fears becoming, yet can’t seem to divert course. A slithery serpent with six pack abs, this could very well be the role McConaughey was born to play. I’m something of a walking contradiction in that I loathe guns in real life yet respectfully view them as a fine and proper storytelling device in film. 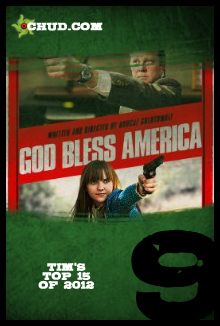 It’s easy to dismiss Bobcat Goldthwait’s God Bless America in light of yet another gun massacre, but it’d be a mistake. America is a darkly disturbing self-reflection, a film that takes the temperature of American pop culture. Frank Murdoch (Joel Murray) is a man apart, torn asunder and predisposed to indignation by a country he perceives as sacrificing its ethical decency. So he resolves to kill the Kardashians, Super Sweet 16ers, and Bill O’Reillys of his fictional world. Not to make it a better place, but just because he thinks they’re all assholes. Few comedies are darker, nor as oddly gratifying. Goldthwait is using farce to illustrate his point, and the result is both shocking and resonant. Performance to Savor: Joel Murray, seen on Mad Men as pant-wetting recovering alcoholic Freddy Rumsen, grounds Goldthwait’s film in a manner that the viewer can identify. You might not agree with his viewpoint or his methods, but he’s too damn earnest and endearing not to empathize with in even the tiniest manner. Measured and restrained, signaling the cold resolve of a man’s final acts before he falls apart. There’s usually one film I come around on before year’s end. In 2011, that was X-Men: First Class. Today, it’s Joe Carnahan’s The Grey: a film I challenged Renn on only to realize he was right on the mark all along. 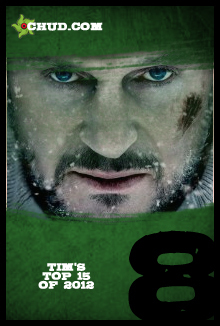 The Grey is a meat and potatoes nightmare work, detailing the struggles of a band of lowlife plane crash survivors as they attempt to forge through tundra of frozen nothingness as both the elements and viciously territorial wolves threaten to stave their efforts. I still have problems with it, including Carnahan’s increasingly apparent inability to end his films, but what works about The Grey is evident throughout. The human struggle for survival against overwhelming odds is made all the more compelling against a seemingly impenetrable wall of nihilism. Beautifully shot, perfectly acted, painstakingly brutal, I can live with the non-ending thanks to the haunting journey that brought us there. Performance to Savor: Frank Grillo, who’s come a long way from his time as a squirelly doof on Prison Break. Buy it from us. Renn’s review. The story of one boy’s effort to tame a tiger from feasting on the nubile, Ang Lee’s Life of Pi is a powerfully touching effort that amounts to the most striking visual experience I had in 2012. 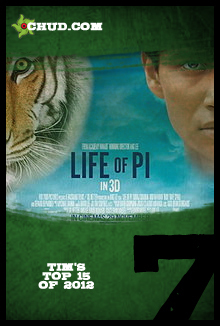 From a haunting shipwreck to Pi’s efforts to tame his ornery tiger Richard Parker, Lee’s affecting film about faith admittedly has trouble sticking the landing. The ending may be a huge kick in the pants, but everything leading up to is so gratifying, so emotionally poetic. On the whole, Life of Pi is a wonderfully dizzying array of 3D, artfully crafted CG, and Lee’s ability to make the relationship between a shipwrecked boy and his CG tiger believable. Performance to Savor: Irrfan Khan, as older Pi narrating his journey. Khan pulled off one hell of a hat trick this year, appearing in two films with characters named Richard Parker. One is a tiger, the other is Peter Parker’s dad. More so than any other in 2012, this stat blows my mind. With Argo, director Ben Affleck has established his brand: confident dramas rife with quality performances, engrossing storytelling, and an adult-minded tone we haven’t seen this consistently since the 1970s. 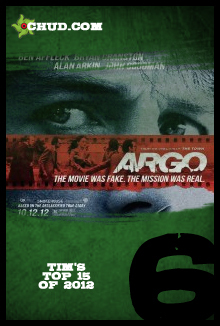 No surprise then, that Argo feels right at home alongside some of my favorite ’70s dramas and thrillers. While not on the level of Coppola (yet), Affleck’s made a film that has no issue standing alongside a work like The Conversation – another film made in a director’s prime and set in one of cinema’s most rewarding periods. Affleck would be wise to stay the hell away from Justice League and that rumored (but unconfirmed) senate run. He belongs behind a camera. And 2012 was a better year because of it. Performances to Savor: Alan Arkin and John Goodman as Lester Sigel and John Chambers, respectively: two Hollywood insiders secretly in the trenches fronting a fake movie. Arkin provides 2012’s most quotable line. Pre-order it from us. Renn’s review. 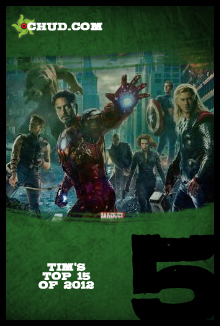 I’m the first to admit, I didn’t have high hopes for Joss Whedon’s The Avengers. I enjoyed previous Marvel films to varying degree (Captain America being my favorite). But nothing prepared me for Whedon’s blockbuster epic – a film that should come to define the phrase moving forward. Cynics can poke holes where they like, but this is a perfect example of the sum being a crowd-pleasing representation of its parts. Avengers is two hours of pay-off, an experience that makes good on the years of groundwork Marvel laid getting us here. An across-the-board success that’s still seeing heavy-rotation in my Blu-ray player, The Avengers is the best comic book film ever made. And that’s coming from a Batman guy. Performance to Savor: The two-pronged offense of Mark Ruffalo and ILM, giving us the finest Banner / Hulk interpretation we’ve seen on-screen. The Hulk’s presence in the last act is unfiltered joy, and proof positive that this character still has a future in film. Director Drew Goddard (along with co-writer Joss Whedon) didn’t reinvent horror with this film, he took everything about horror, jammed it into a bottle, shook it up and spilled forth a frothy brew that genre fans will drink down for years to come. This is the ultimate horror mash-up film, where Goddard gives life to a world where Hellraiser, The Stangers, Dawn of the Dead, Texas Chainsaw Massacre and a host of other horror films all exist – an all-star, role-call, best of compilation. 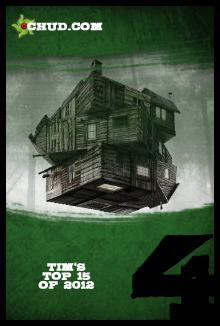 Goddard made a horror mixtape and called it Cabin in the Woods. For future reference, any film where entrails get spat out of a man-eating merman’s blowhole will earn consideration on this list. Always. Performances to Savor: Bradley Whitmore and Richard Jenkins, as the puppetmasters of the titular cabin. These two performances illustrate everything I love about the film, as their presence is the prism filtering out Goddard and Whedon’s horror goodness. Buy it from us. My brief write-up. Neill Blomkamp. Shane Carruth. Rian Johnson. These are the names I’m pinning the future of original science-fiction storytelling on. With Looper, writer / director Rian Johnson once again knocks it out of the park. And if you’ve seen Brick or The Brothers Bloom, there shouldn’t have been any doubt. Looper, a taut, brilliantly engrossing time-travel thriller, is the best sci-fi film since Blomkamp’s District 9, and reminder that original sci-fi is always going to have a more celebrated shelf life than the constant stream of (usually) limp franchise fare Hollywood clings to. Johnson provides vivid world-building that gives way to iconography on the level of a Blade Runner. Years from now, sci-fi fans will be proudly showing off their blunderbluss replicas on their prop shelves. And seriously, are we all in agreement that Kid Blue grows up to be Abe? Performance to Savor: Joseph Gordon-Levitt, making good on the promise he first showed us in Johnson’s Brick. Assisted with a prosthetic nose, the gifted actor channels a young man who will someday grow up to be Bruce Willis. And yet JGL steers clear of imitation, instead adopting Willis’ mannerisms and forging a character all his own. Modern film’s most ambitious effort, ever. That Cloud Atlas has been so roundly dismissed in popular culture is borderline criminal. Tom Tykwer and The Wachowski Starship have assembled a moving, poignant and infinitely poetic work out of what many believed an unfilmable book. The result is a brave project. Its place in history, its overall contribution, won’t be felt for sometime. Not enough people have discovered it yet. But it will be felt. This is a movie that extends your notions on what film can and should be. That it fails in parts only makes its successes that much more rousing. Part anthology, part self-affirmation, Cloud Atlas is, at its essence, a call for change and self-betterment as we follow a soul’s journey from revilement to redemption. 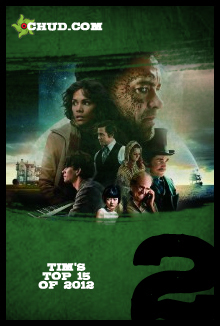 All set to the tone of Tykwer’s gut-churning score, Cloud Atlas is an accomplishment that demands discovery and rewards understanding. Performance to Savor: Ben Whishaw. Though he plays a variety of characters through the film, his performance as troubled composer Robert Frobisher is a career-maker. The most touching and tragic in all the film. Notify for pre-order. Renn’s review. Without question, Quentin Tarantino is the finest filmmaker working today. He’s also one of the more unique, as no other director is as deft at applying his influences to create unique works. Django Unchained is a cinematic celebration made by one of cinema’s greatest lovers. I don’t subscribe to criticisms that the film’s tinged by bloat, if only because bloat shouldn’t feel so richly rewarding. Robert Richardson blankets his cinematography in rich colors, gorgeous landscapes, and a clarity that highlights the cracks in the faces of the performers. This is an ugly film, but beautifully so, one that blends Tarantino’s own sense of morality with his predisposition to almost comedic levels of violence and gore. 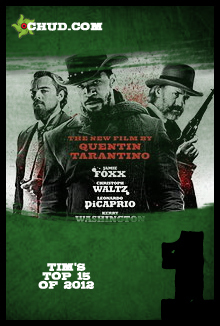 Not my favorite Tarantino film, but undoubtedly my favorite film of the year. A great story, well told: an objective that no modern storyteller is more accustomed to reaching than Quentin Tarantino. Performance to Savor: Samuel L. Jackson as slave Stephen, reminding us why we love him. A phenomenally dark performance by a prolific star who rarely acts. Pre-order from us. My review.